The photos do not do justice to the awesome pieces that reside in this outfit. I was rushed, the light was too bright from the glare of an overcast sky, and black does not photograph well. 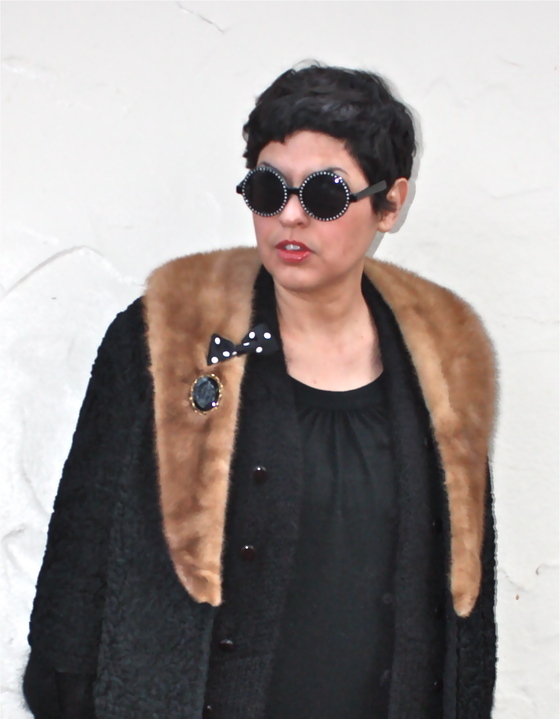 What you are missing are is the mother lode of textures- the needle-like hairs of the fur, the curls of silk ribbon on the coat, and the black clouds of cuddliness that made up my new-to-me thrifted mohair sweater. 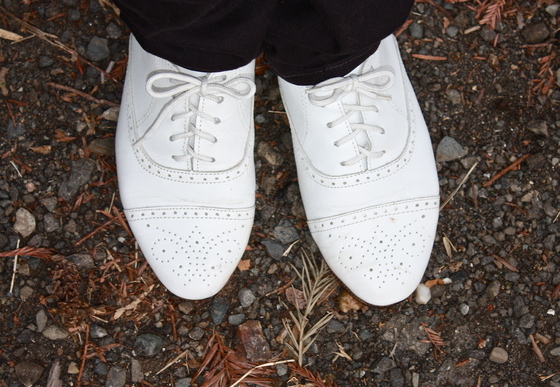 Feeling quite jaunty, I slipped on a neglected pair of bright white brogues. I need to wear them more often. 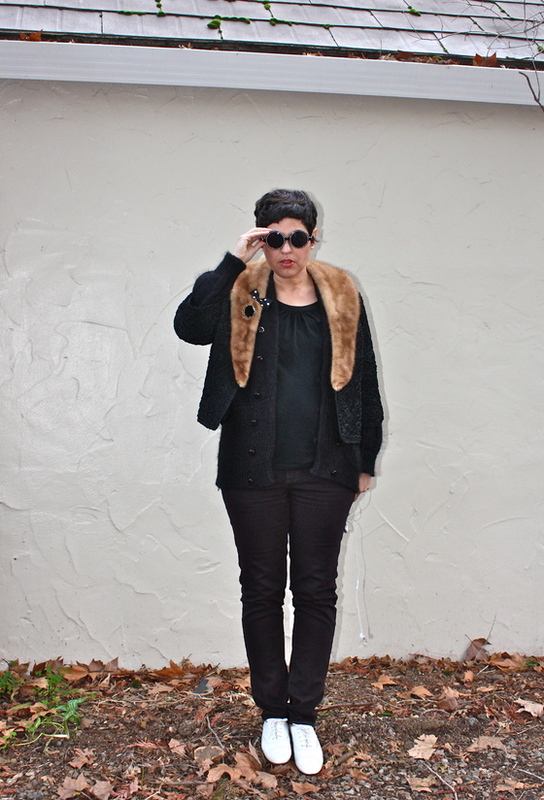 Something I'll be wearing more often are these freshly thrifted black round sunglasses. If a pair of sunglasses is big and round, I'll want to wear them. I call it the Apfel effect. I want to look like this bold goddess. So I buy and wear, round lensed sunglasses. I look so serious yet off-beat. I'm so drawn to raggedly eclectic and eccentric looks that are a bit long in the tooth. A post-modern old fashioned. A black winter spinster. Are you seeing it? THIS OUTFIT IS 99.99% SECOND-HAND. So booyah! I just adore this outfit, so much, my dear Bella. I think all my clothes are secondhand. Those glasses are such a great nod to Iris, and I adore her style. You have got it going on, Bella. gosh your writing is intense. i wish i experience anything the way you experience clothes! I love the little details, like that bow... so cute! I love this entire outfit, particularly the sunnies & brogues! I have never seen so many photos of Apfel as a younger woman as in this video~she has always been fabulous. The sunglasses were a wonderful find! Nice outfit. Such a classic. I hate how difficult it is to properly translate textures in dark clothing in photographs, especially when you're in a hurry. In the second photo I can see some really nice texture on the coat and cardigan. ps. I love the sunnies. 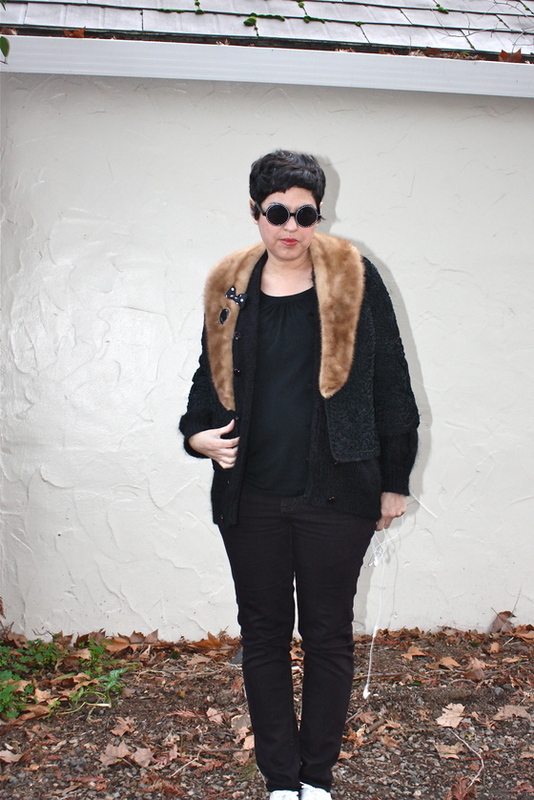 Love the glasses and certainly loving the fur detail on the coat! You rock!!! What a rocking outfit! Those glasses look great, loving the detail on them. Even a bit a fur to give a touch of glamour. Thank you so much for visiting my blog and left your gentle words. I am touched that you haven't forgot me. I like intensive colours and black is definitely one of them, especially when it is paired with white and statement accessories like yours. It is hot most of the time in Bangkok so I don't have any chance to try on fur or jackets. They look really nice on you Bella. Maybe you should start a spinster blog, let's make unmarried older women cool!!! Love that outfit, the granny-chic jacket and plimsolls are such a marvellous contrast. it's fabulous! i love the details on the jacket...and i know the texture well, even if it doesn't translate in photos. i love it! Very strange and very interesting. I like it. 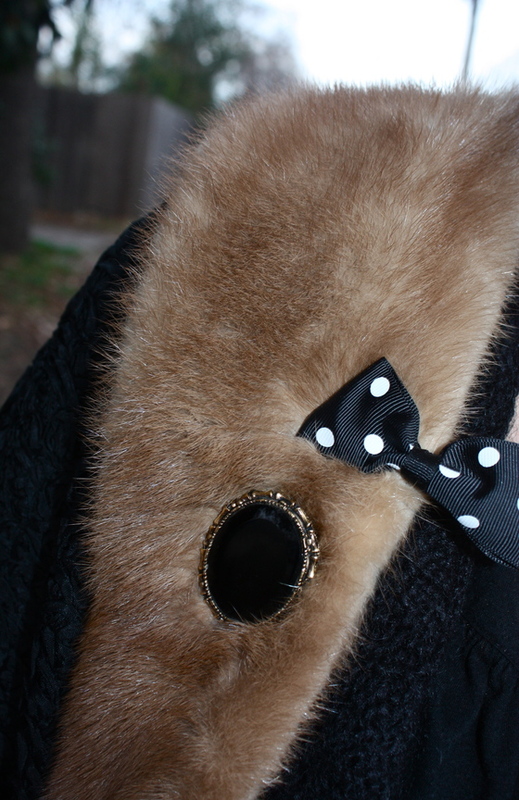 The detail of the polka dot bow tie made me smile. Eclectic and eccentric are a great combo! My husband has been wearing his bright white vans lately and I'm loving them. Then you're wearing these and I think that I must get some bright white sneaks. Love the contrast with all black. love the white with black. You are brilliant, whatever you want to call your style. I've seen that video, love learning about her life. She's one of a kind. Reminds me of Diana Vreeland. Absolutely love the jacket, I plan on doing a similar look real soon. The eyewear is insane!! I'm wondering if those are little LED lights around the sunglasses or rhinestones. You could pull off the LEDs, but you look wonderful in the rhinestones. Fun piece!